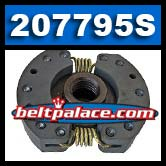 Hoffco-Comet 207795S Clutch Assembly (350). Hub, Shoes, and Springs fully assembled. OEM Hoffco One Man Powered Earth Augers (HOFFCO 217513H, PH980-E, PH1700-A) Post Hole Diggers with Tecumseh 2-Stroke engines, and Earth Drills. Threaded shaft. 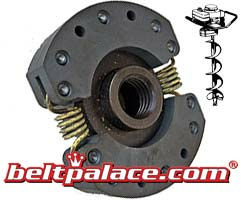 Replacement clutch for Hoffco 1700 Transmission Gearboxes. THESE PARTS ARE IN STOCK! Hoffco PH5000 Two-Man Auger Clutch. Comet 208119S. 3-1/2" Dia., 7/8" Bore. Hoffco-Comet 217895S. PH2000-E Earth Auger replacement clutch. Hoffco-Comet 217895S. PH2000-E Earth Auger replacement clutch. 7/8" Keyed shaft. 3.5" Dia., Bolt-on unit (NO threads).